But the leaders and members of the Iglesia ni Cristo (INC) think they are above the law, that the law against road occupation, especially Edsa, may apply to other groups but not to them. Rule of law vs. welfarism. Many INC members who went to Edsa were recipients of various welfare programs and now lambast the government. One more proof that when government is lousy in enforcing the rule of law, it can be lousy and wasteful in its populism and welfarism. I was one of their millions of Edsa traffic victims. Last night, Sunday, my bus from Pangasinan arrived at Cubao terminal around 12 midnight. Immediately I sensed a problem. Very few metro buses going south, the taxis were haggling for higher price, few “ordinary” cars but there were many provincial jeepneys and buses plying Gapan-Cabanatuan, Lubao-Angeles, Dagupan-La Union, etc. And there were many vans too that appeared to be full of people. I sensed that they were Iglesia members wanting to further choke usually traffic-choke Edsa. After waiting for about 25 minutes, I was able to ride a south-bound bus. There were many people walking in Cubao going south. At Camp Crame, I saw many parked provincial jeepneys, buses and vans. Our bus was crawling. I saw many New Era University buses (Iglesia-owned) carrying many passengers. I think those were among the hakot buses. There were also many vehicles, provincial jeepneys and buses, parked on the other side, north-bound, of Edsa. At Ortigas flyover, south-bound traffic has finally halted, past 1am already, Our bus went to C5, we managed to evade the Iglesia mob rule at Edsa-Crossing. We exited at Edsa Buendia. Magaling, si Sec. de Lima kaaway nyo, dinamay nyo milyon pa na ibang Pilipino. I arrived home past 2am. Last Saturday midnight, around 2:30am, I travelled to Cubao to go to a provincial bus terminal in Cubao. Edsa-Crossing was closed, blocked by MMDA vehicles and officers. I think there were very few Iglesia rallyists at Edsa-crossing. Is MMDA Chairman Francis Tolentino an Iglesia member too? His boys are busy apprehending and penalizing many motorists in Edsa for "obstruction of traffic" and other traffic violations. But these Iglesia militants blocking a big portion of Edsa are allowed and guarded by his boys. Mob rule can beat rule of law anytime when governments are too busy with so many functions, state-owned businesses and welfarist/populist functions. Penalizing motorists even for minor traffic "violation" (and they created lots of prohibitions and restrictions; more prohibitions, more potential violators, more fines and extortion) that transform traffic officers into tax and fine collectors, good business. When real traffic violators like a mob occupying a very busy road come in, those "public servants" chicken out. The Iglesia leaders and their followers always think they are above the law. They can demand money from local to national candidates every 3 years election period in exchange for political support via bloc voting of their members. They hate that their leaders can be subjected to DOJ criminal investigation involving illegal detention of their former "kapatid" whom they have later expelled. The big issue is the inability of the government, both national and local (PNP, MMDA, City governments) to enforce the rule of law -- the law against road occupation by any groups and penalizing violators. If you are a big church group or cult like Iglesia, you can get away with the law with zero penalty. Some leading Presidential candidates even blatantly and shamelessly support the mob rulers, so long as they can support him/her in the elections next year with their known bloc (and mindless?) voting. If the government, local and national, allows exemptions to the restrictions of the law (the law applies strictly to some but not to others), then that is rule of men. The rulers make arbitrary exemptions and applications of the law. And Carlos Celdran, why he did not lambast the "Damaso" of Iglesia? Maybe he's scared of this church's mob while he was confident that the Catholic church won't harm him. 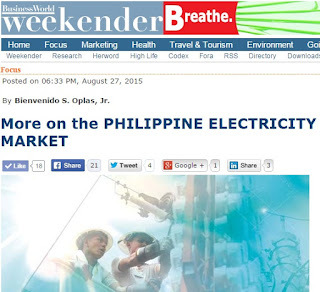 * This is my article in BusinessWorld Weekender last Friday. 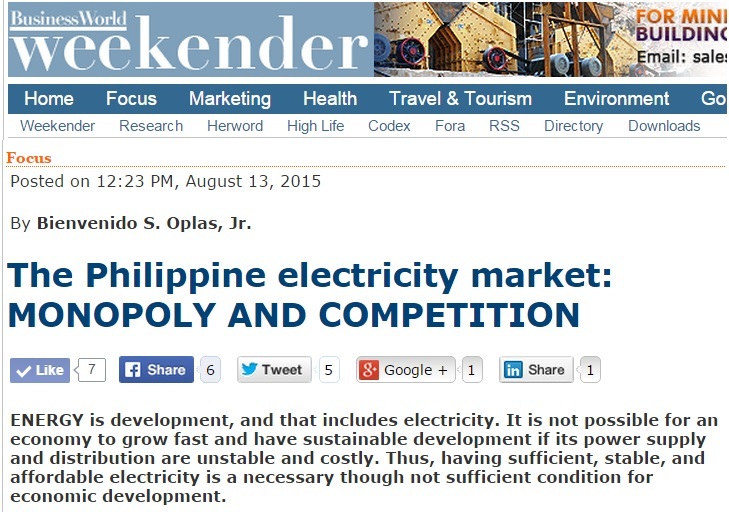 THIS is a continuation of an earlier discussion, “The Philippine electricity market: Monopoly and competition” (Weekender, August 14). As noted in that article, Carlos Jericho L. Petilla had issued, before he resigned as energy secretary last June, DoE Circular No. DC2015-06-0008, “Mandating All Distribution Utilities to Undergo Competitive Selection Process (CSP) in Securing Power Supply Agreements (PSA).” That order aims to address, among other things, the suspicion of “sweetheart deals” between some big electric cooperatives (ECs) and distribution utilities (DUs), on the one hand, and the generating companies (gencos), on the other, resulting in expensive electricity prices in the Philippines. Here is another data, a bit old, from a 2013 commissioned study by the US Agency for International Development (USAID). The first set shows the actual prices including taxes (in Philippines and Singapore) and subsidies (Thailand, Malaysia, and Indonesia), and the second set, adjusted prices if taxes and subsidies were minimized, next to zero. Thus, most if not all comparative electricity prices are based on artificial pricing. People blame gencos or the big DUs but not governments which intervene a lot in electricity pricing, resulting in either very high or very low prices. 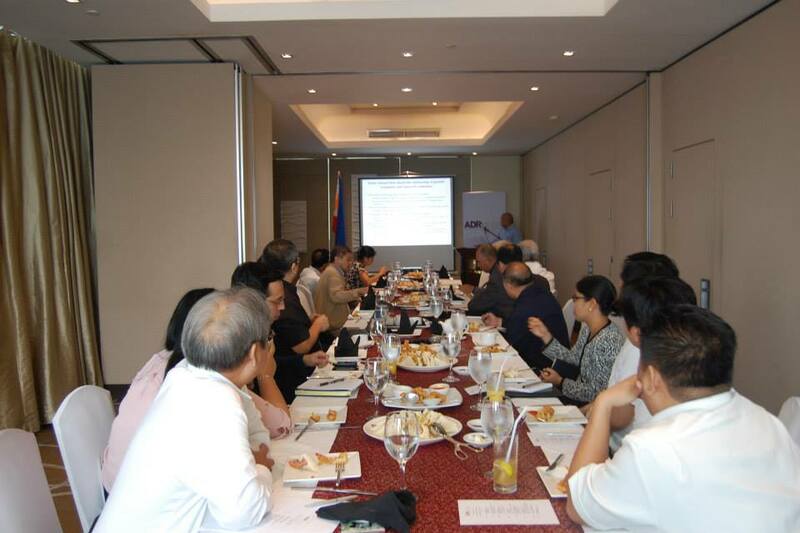 The DOE Circular was the subject of discussion in a forum organized by the Energy Policy Development Program (EPDP) early this month. There were six speakers, led by OIC-Secretary Zenaida Y. Monsada of the Department of Energy (DoE), Director Mylene Capongcol also of the DoE, UP School of Economics professors Raul Fabella and Ruperto Alonzo, UP College of Engineering professor Rowaldo del Mundo, and Romeo Bernardo of LBT Consulting. Mr. del Mundo is the lead technical adviser to the Central Luzon Electric Cooperatives Association-First Luzon Aggregation Group (CLECAFLAG) under the USAID COMPETE project. Twelve ECs in Central Luzon aggregated their total power demand of 300 MW, auctioned it off, and contracted for 20 years the winning supplier, won by GN Power (with expanded capacity of 1,200 MW in Bataan). 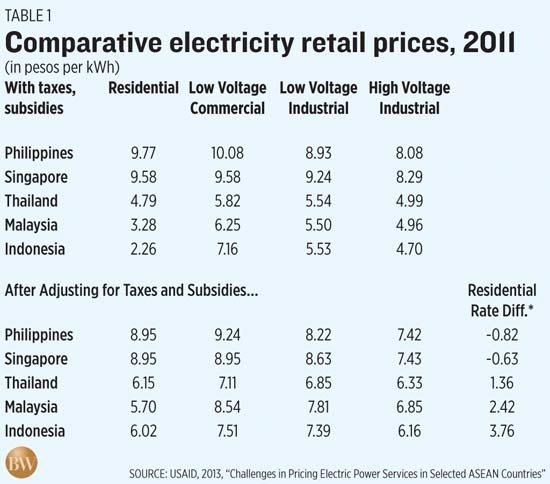 In his presentation, Mr. del Mundo showed this table of comparative electricity prices in the ASEAN. 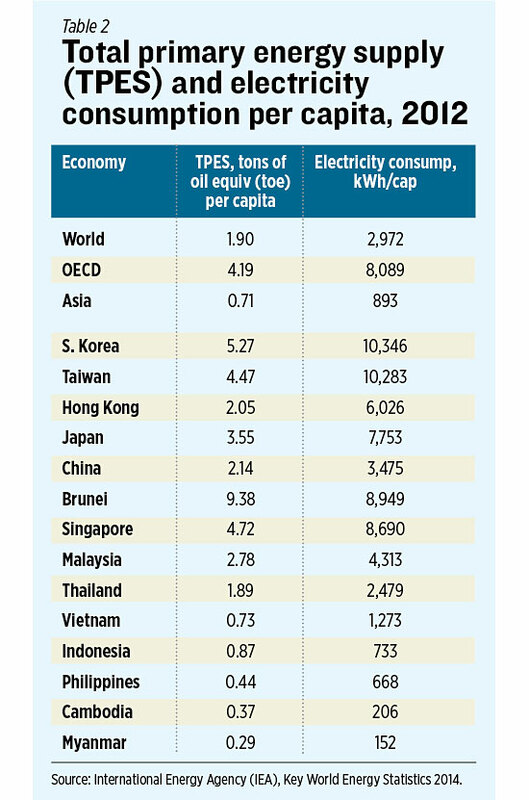 One, as shown in Table 1, we have high electricity prices because the government imposes many taxes on energy while other ASEAN countries subsidize their energy consumption. Two, Mr. Bernardo noted in his presentation that “Growing pains from regulatory uncertainty, and contracting, approval, and construction bottlenecks have delayed new plants. The average time it takes to build a baseload power plant in the Philippines is probably double elsewhere. Just getting approvals, coupled with overcoming NIMBY opponents, is an ordeal.” And he showed this list of some 200 signatures and permits needed to put up one baseload plant. Three, Mr. Fabella suggested market testing of PSA contracts instead of mandatory CSP. Market testing is easier to enforce because the Energy Regulatory Commission (ERC) only verifies and approves the market test (say, auction) employed, and is easier to defend in public. There are many modalities for market testing like the cases in Chile, Brazil, New England. Four, there’s the big question of who are the “third parties” that will be recognized by the DoE, the ERC, and the National Electrification Administration (NEA) which will approve or disapprove the PSA between the DUs and gencos. Will they work for free? Very unlikely. Rather, the DOE and ERC will be forced to make extra budgetary requests to pay for these “third parties” including allowances for their meetings and public consultations. It is also possible that NGOs, the media, and other sectors actively or silently supporting the “Repeal/Abrogate EPIRA” movement may position themselves as “third party” referees. The DoE circular is not about repealing or tinkering with the EPIRA. In short, the DoE circular is barking at the wrong tree: By making the competitive bidding mandatory rather than voluntary, it will invite or create more problems than what it intends to solve. The circular should therefore be withdrawn. Or amended to make CSP voluntary, not mandatory. The DoE and other government agencies should instead address other problems and contributors to expensive electricity in the country. Like multiple taxes, numerous permits by the Philippine government, from the barangay to city/municipal, provincial, and national government offices and agencies. Requiring a firm to present up to 200 different permits would expose it to 200 different opportunities of corruption and extortion. Government should simply learn to step back from too much intervention, regulation, and taxation. 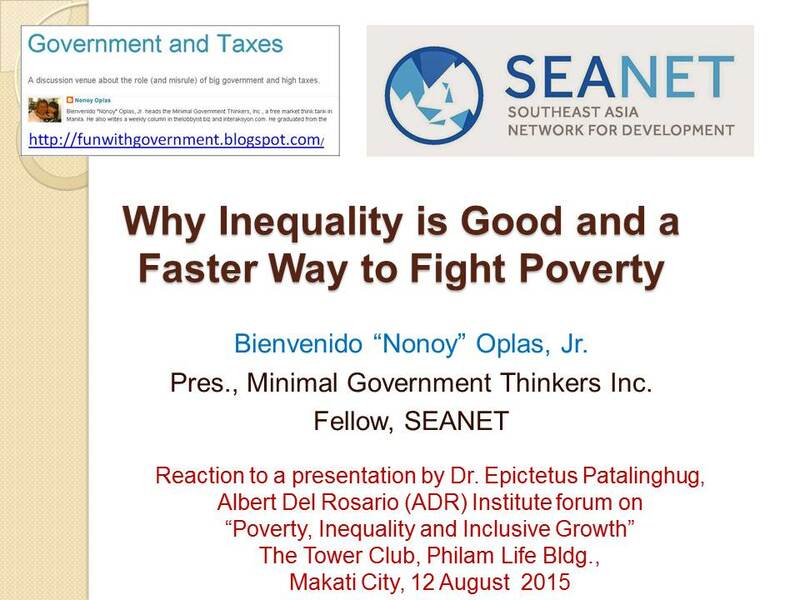 Bienvenido S. Oplas, Jr. is president of the free-market think tank Minimal Government Thinkers, Inc., and a fellow of the South East Asia Network for Development (SEANET). 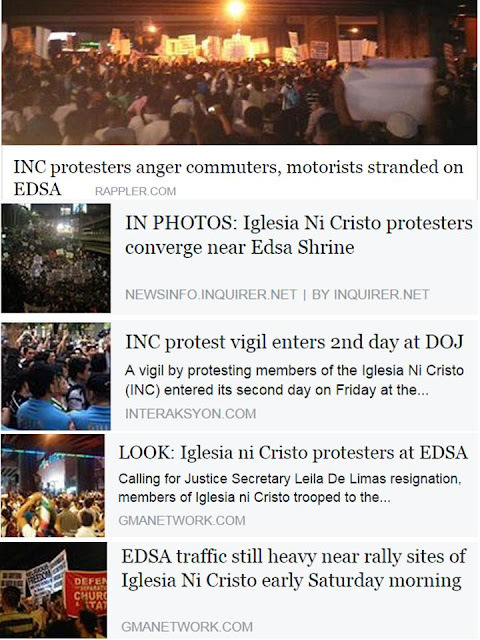 Members of the Iglesia ni Cristo (INC) who are militant and shameless enough to create more traffic in Edsa -- yes, they gloat, they brag that they have created more traffic in the busiest road in the whole country -- in pursuit of their political opposition to DOJ Secretary Leila de Lima, are still there. This church group is known for their bloc voting during elections. From Municipal and City Mayors and Vice Mayors, Councilors, to Provincial Governors and Vice Governors, Board members, to Congressmen and Senators, and to President and Vice President. There is big money involved of course, although Iglesia leaders will deny it. That is just one example of their political and electoral meddling in the country. Now they demand a "separation of church and state." The leading contenders for President in the 2016 elections are treading carefully, if not favorably, of the INC.
What a shame, Sen. Grace Poe. I was leaning to support you, but with this statement, goodbye na tayo. These Iglesia militants in Edsa are defending their insecurity and hypocrisy, not their faith. If they defend their faith, they should be in their churches, or other public places, NOT in already traffic-choked Edsa. 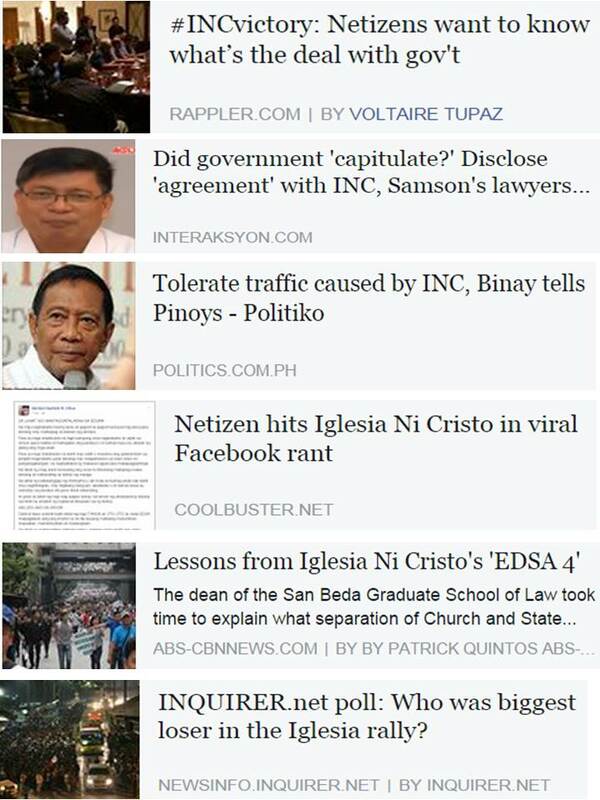 VP Binay is known for political opportunism. His statement is expected, not surprising. Pag may dugo, sisipsip talaga ang linta. Sec. Mar Roxas, good statement here. I hope you will order the PNP to clear EDSA of these militants. Iglesia members will hate you if you do that, but you will gain more votes from the non-Iglesia. The President has spoken, rightly. Thank you Mr. President. Mandaluyong city Mayor Ben Hur Abalos and councilors are also scared of the Iglesia militants. The city government gave a permit after the militants have already created horrible traffic in Edsa since last night. And MMDA Chairman Francis Tolentino, you and your boys are too eager to apprehend and penalize many motorists everyday for "obstruction of traffic" or other "traffic violations" in Edsa. The Iglesia militants are obviously creating heavy traffic and you allowed them. Scared also of the Iglesia that they might reject your Senatorial ambition next year. Any serious politician who will challenge this Iglesia bullying and risk being rejected by their bloc voting deserves support. We are not talking about shrinking government here. We are simply talking about government being able to enforce the rule of law. The law applies to all, it applies equally to unequal people. If all other groups are prohibited -- and they should be prohibited -- from occupying Edsa, then that law should apply to the Iglesia militants too. In this case, the Iglesia guys are exempted. Mob rule beats the rule of law. Below are my random thoughts about the ongoing occupation of EDSA -- the busiest road in the Philippines -- by members of the Iglesia ni Cristo (INC) religious grooup. Government, go back to your main function -- enforce the rule of law, end mob rule and rule of men. Stay out from too much welfarism. Government is often too busy with endless welfarism and populism, placating the irresponsible and opportunist sectors of society, that it becomes less efficient, there is government failure, in quick justice administration, protecting private property, protecting lives from bullies, kidnappers and murderers. If these hypocrites, them and other aspirants of "people power in Edsa" think it is their "right" to self-expression and "freedom of assembly", then other people also have freedom of movement to use that very busy road. The right of the latter is more important than the purported right of the former. Many people have warped and corrupt thinking that they can politicize everything. There are many concerns where the proper forum are the courts, not the streets, and much less EDSA. And it is government role to convince the public that justice administration is credible and fast, not biased and slow. If there is government failure in its most basic function, enforce the rule of law, then expect government failure in its non-basic function, like endless welfarism. 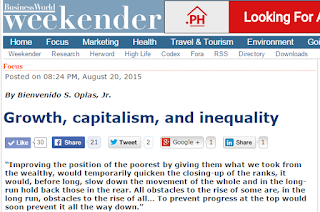 A poor household may get free education, free PhilHealth coverage, free housing, etc. but if their small savings like cows, a tricycle can be easily stolen, their kids can be easily abducted and raped, there is breakdown in rule of law and protection of private property, what are the uses of those welfarism? On another note, with this Iglesia/INC hypocrisy and mob rule, Leila de Lima will gain fast in the Senatorial surveys. And any Presidential candidate who can boldly state that if they win, they will tax the church, Catholic or Iglesia or other religious groups, will likely get voters support. Since almost all church groups meddle in politics, they might as well be meddled in their income and properties. Then income taxes can go down significantly, Raise the tax base, not the tax rates. Many people have deep suspicion of that church, being despotic and arrogant. Now these suspicions are publicly confirmed. 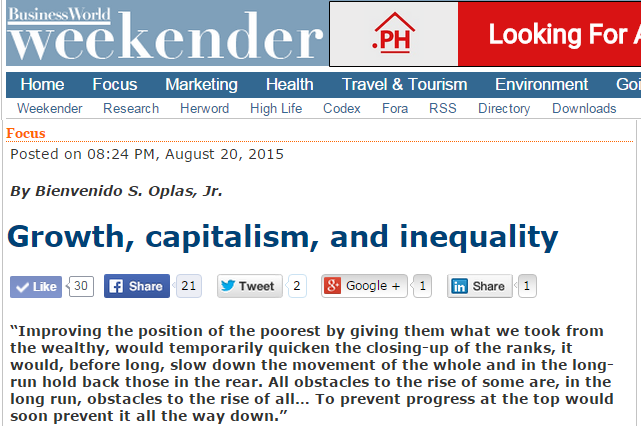 The longer they stay in Edsa, the more that they alienate themselves from the rest of PH society. Iglesia is being divided slowly, by themselves. Some have been illegally imprisoned, kicked out, some have quit the church, and those who don't believe in their street demos in Taft and now Edsa. 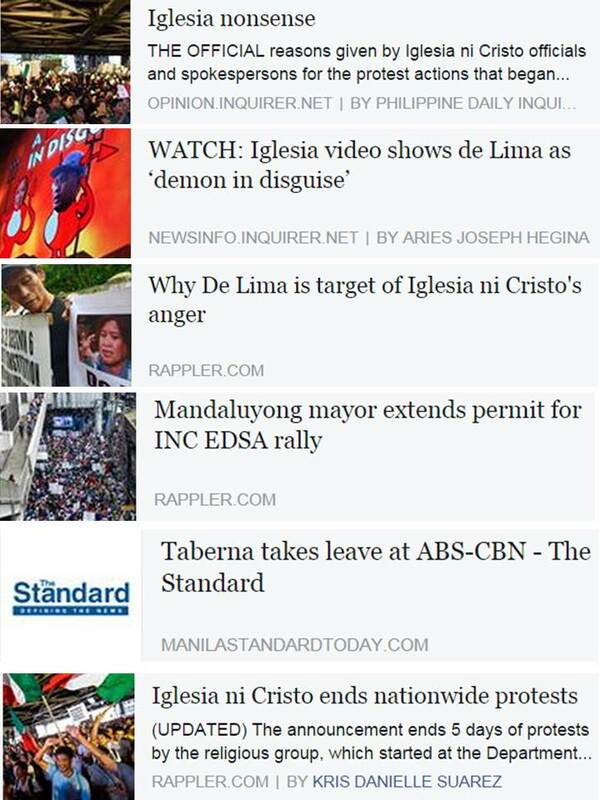 Iglesia personalities like Anthony Taberna of ABS-CBN and his camp will most likely go against these militants. Meanwhile, good points from a lawyer friend, Atty. Jojo Garcia. A crime is committed, the victim files a complaint, the complaint is investigated, the offender is charged. This is the simple math of crime and punishment in any society and under whatever government. It is part of the social contract citizens have entered into with the State, that in order to establish the rule of law, instead of vigilante justice or the rule of the mob, the people give the mandate of exacting justice to the State under a constitutional regime. The alternative is the law of the jungle. No individual living within the territory and jurisdiction of the sovereign State endowed by its people with the mandate of enforcing the rule of law is exempt from this paradigm. People may belong to other smaller collectives, including religious organizations, but this does not exempt them from being subject to the larger collective of the State. Philippine citizens may be Roman Catholic, Muslim, Protestant, Iglesia ni Cristo, atheists, Rotary, Boy Scout or Girl Scout, fraternity or country club members, Liberal, Nacionalista or UNA, but they are first and foremost Philippine citizens living in its territory under Philippine laws. No one, by virtue of mere affiliation to these smaller collectives, is above the law. Membership in these organizations does not give anyone a free pass from investigation and prosecution if a crime is committed. This is the basic principle behind the rule of law under one sovereign established by the people through government. 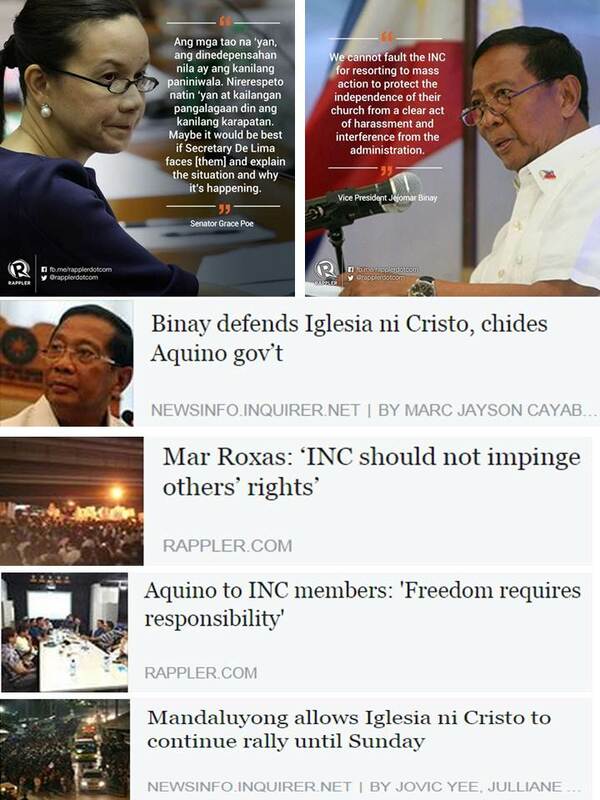 No one can be Iglesia Ni Cristo or Roman Catholic first and Filipino citizen second. We are all citizens first, everything else is secondary. This is the real meaning of the separation of church and State. No church or religious organization should confuse itself as being endowed with the powers of the State. No church or religious organization should bear the illusion that it is higher than the sovereign, and that it can impose itself on others, least of all the State, by its sheer strength in numbers. No church or religious organization can ever play with the notion that it is a State and a government in itself, its members or officials exempt from the laws of the State, and entitled to their own system of justice within their ranks. This is what separation of church and State is. The opposite is the establishment of religion, which is proscribed by the Constitution. When the State relents and looks the other way so that members of religious organizations can settle alleged criminal acts among themselves and within their ranks, within the walls of their temples, according to whatever ersatz system of crime and punishment, it gives an unwarranted concession to these organizations at the cost of performing its sovereign mandate and the rule of law. If the State will willingly surrender a sovereign function and constitutional mandate to any religious organization, it is not doing so in accordance with the separation of church and State, it is doing so in violation of the principle of non-establishment of a religion. The Department of Justice cannot give any exemption or special treatment to any individual or group, including religious organizations, their officials or members. It can only apply the law and perform its mandate equally and impartially, without regard to power and influence and strength in numbers. When it investigates the allegations of kidnapping against officials of the INC, it cannot buckle to the pressure of a few thousand, or even millions, of devotees massed at its gates, and supplant the rule of law with the rule of the mob. If the INC officials and members complained of by Isaias Samson and other INC ministers are innocent, they should face the complaints like any ordinary Filipino is required to by law, instead of calling out their flock under misleading premises set to obfuscate the issues more than clear up the allegations of kidnapping. The veracity of the complaints is yet to be determined in a preliminary investigation. We should all follow the procedure, complainants and respondents alike, and allow justice to take its due course, instead of pre-empting and pre-judging its resolution. The DOJ and the government cannot allow every Juan, Jose and Pedro, every religious sect or private organization, to have its own system of justice. This is not separation of church and State. Neither is it freedom of religion. This is vigilantism pure and simple, seditious and anarchic. 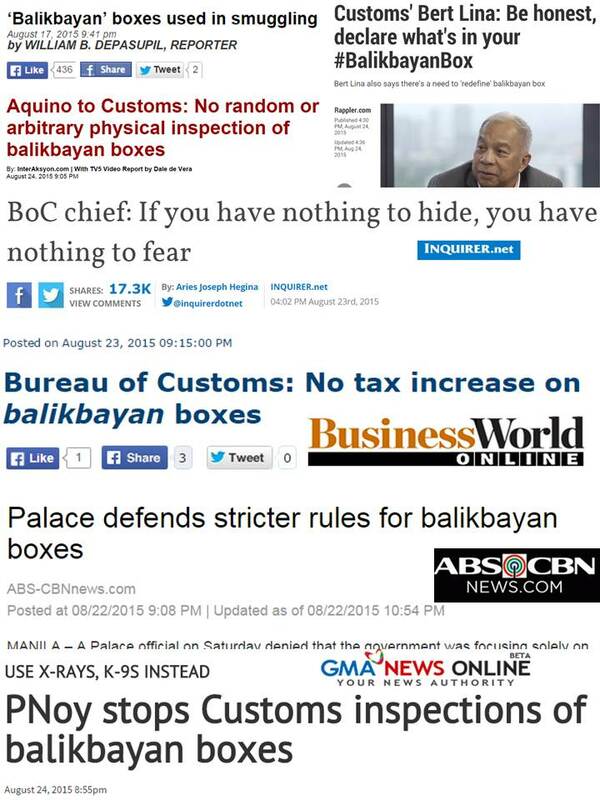 The balikbayan box controversy stirred by the Bureau of Customs (BOC) plan to conduct random physical inspection of the boxes seem to have tapered off. The President intervened and ordered the BOC to stop its plan. It is a bit condescending for BOC head Bert Lina to ask the OFWs to be honest when he knows that many BOC personnel are very dishonest and corrupt. See comments below. Demanding honesty from the public is understandable, but demanding honesty from the bureaucracy is even more important. This post from Philippines Shocking History last August 22 helped stir the controversy, especially in inviting more frank comments (700+) and spontaneous sharing of personal experiences of commenters in the hands of BOC officers. 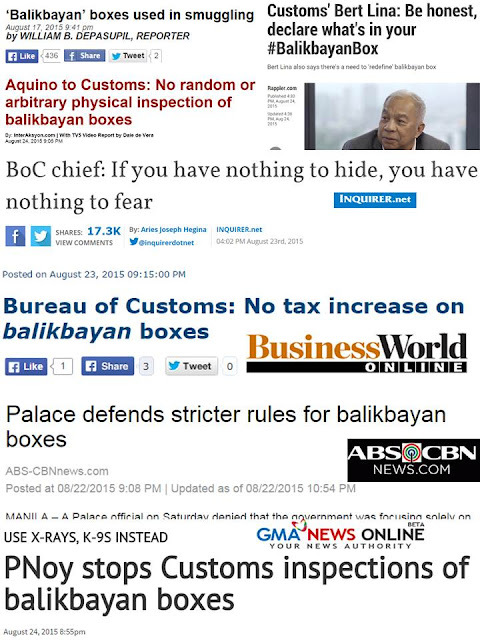 And these are mostly small boxes and parcels, not those big Balikbayan boxes. In the minds of the public, corruption and extortion at the BOC is high, whether the commodities are big or small items. So that whatever reforms for the better that BOC leadership may introduce, people always suspect that it's for the worse. People want free trade, zero import tariff, minimal non-tariff barriers (NTBs) especially for their personal and household needs. Sending personal items from family members and friends abroad to their folks in the country is not a crime that should be punished by high and often, multiple taxes. The various comments that followed were too revealing and frank, copy-pasting some of them here. 1. 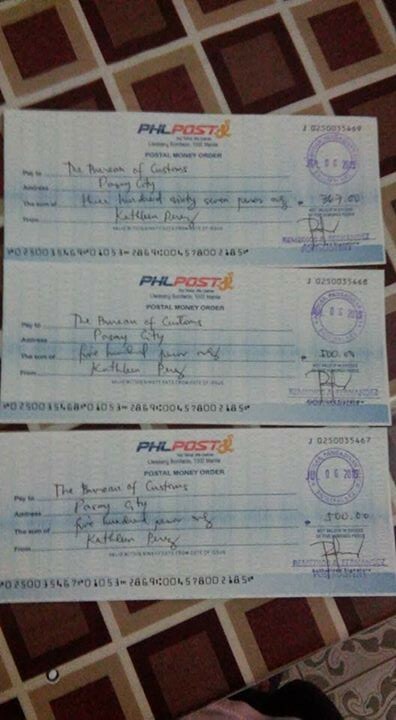 Kei Chan Tal: Ayan din sakin...shirt book and cd lng laman may tax pa...eh mas mhal pa ksa dun sa purchase ko shet kaung customs! Bkit di aksyunan ito ng gobyerno?! Tarantae mga to! 2. Annmariel Lunar Sumiog: nangyari n din sqn to eh, s philpost din, may pinadalang laruan at VS lotion from u.s yung friend ko, nagulat aq kc cla n mismo nagbukas, tapos ung feeling n interesado cla s mga laman nun, sabi ko kita neo nmn puro pambata lng laman n padala, nung makita nila ang laman pinalabas aq at pinagbayad ng tax...d q n mtandaan kung magkano..d q n dn pinansin kala ko kc sqn lng ngyari... nkakainis cla..
4. Beatrice Lim i just got taxed last week for the books i had delivered which supposedly according to Florence agreement should not be. andami pang BS binigay sakin about categorization and applying for exemptions. mga mukhang pera! 4. Gamaliel Cruz Salen Ganyan din nangyari samin parang hostage ung package namin kailangan tubusin. 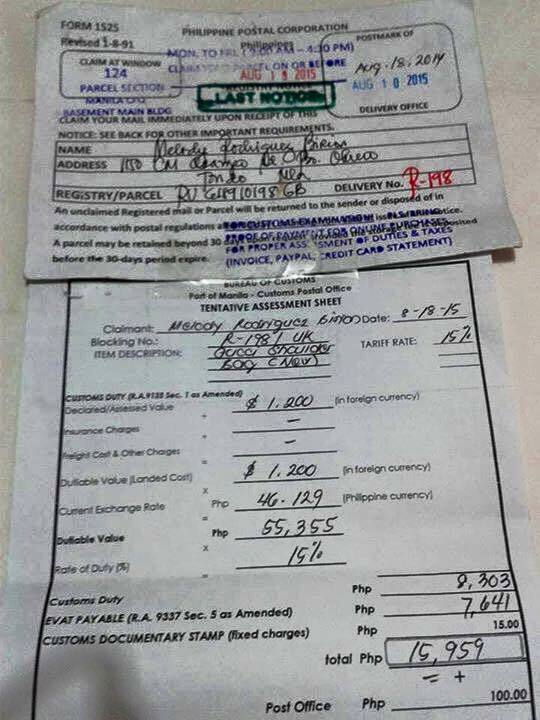 Pati ung libreng gamot para sa liver cancer na libreng binigay ng hospital ng Netherlands may tax! Libre na may tax pa! 20k ung tax ng libreng gamot. Mapapawow ka na lang talaga! 7. Jeng Desu Tagal n yang mga style na yan unang labas pla Lang ng PSP pinadala sa anak ko galing Japan nung ngpunta ko sa main ng custom para I claim pinabuksan nila ung ems box tapos pati sobre sa loob pinapabukas nilang pilit sa kin sabi ko sulat LNG yon nagpilitan kmeng bukas ko daw ung sobre nkipagtalo ako kc Nga lapad ung laman nun Kung gusto ko daw bayaran ko ung tax ng 5000 para maiuwi ko n ung PSP ng anak ko at sscreen daw Nila ung sulat at pilit nilang kinukuha sa akin ang sv ko tatawagan ko muna ang tiyuhin kong pulis na malapit lng sa area ayun ung 5000 naging 1,500hayup tlga eh noh! 8. Junel Padigos That's true. I ordered a nursing book online for my cousin and have it sent to Cebu. What happened is it's too late for the notice to arrive, only got delivered when there was a needed penalty installed. Too much corruption. What a sad state for a government that has not learned. 9. Sa Murri totoo yan! nangyari sa akin yan may padalang 1 food supplement kapatid ko para sa nanay namin sinisingil ako ng P5,000! Hindi ko alam san kumuha ng mga numero mga yan para singilin ako ng P5,000. May mga nakasabay pa ako dati mga sample ng bote e basag nung binigay sa tao sabay sinisingil pa nila. ang kapal ng mga mukha! 10. Redacrem Kir Ako nga nag send ng sale na damit for my daughter, yung damit worth $50AUD lang. Ang hinihinging TAX 800PhP sabi ko wag nang kunin. Wag na lang mag padala. Ang mga lintik na abusado.. 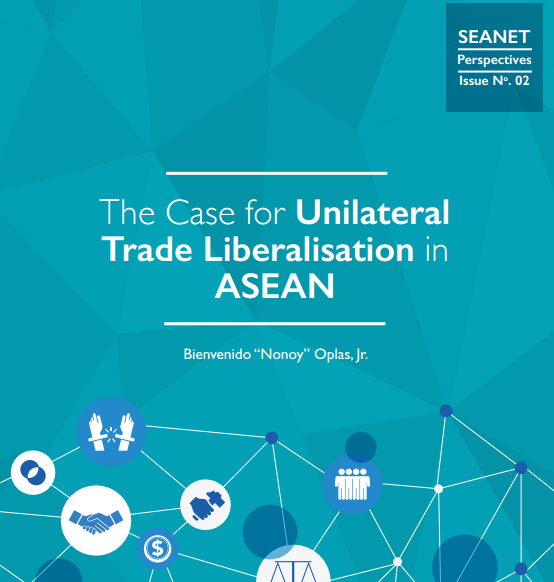 The South East Asia Network for Development (SEANET) published its second issue of Perspectives or policy note this year, 20 pages long. Incidentally, it was written by yours truly. Free trade has many variants like bilateral free trade agreement (FTA) or economic partnership agreement (EPA), regional (ex. ASEAN FTA or AFTA), cross regional (ex. RCEP, TPP), multilateral/global (ex. WTO negotiations), or plain unilateral, one-way free trade policy. This paper discusses the latter. 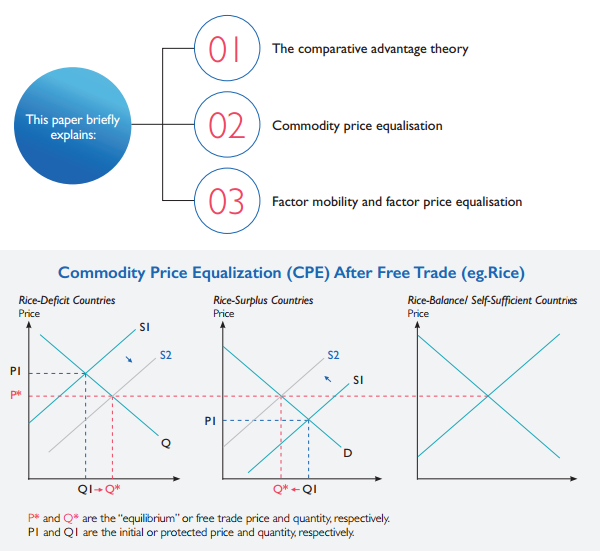 It starts with some basic theory, from the classical David Ricardo theory of comparative advantage, to commodity (CPE) and factor price equalization (FPE). Here, CPE an illustration of CPE. 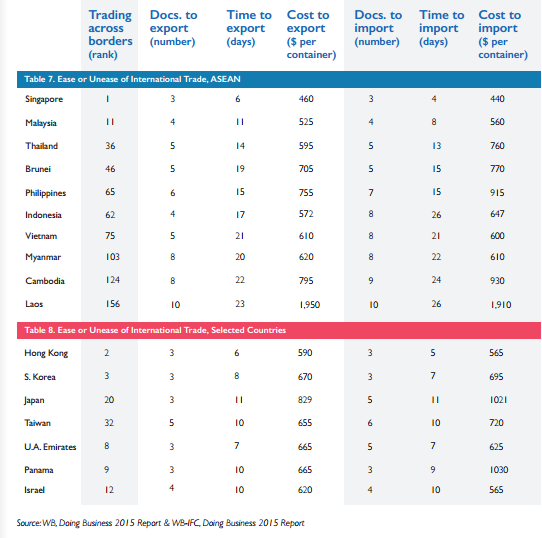 Through time, the average ASEAN Trade in Goods Agreement (ATIGA) rates have been declining. Singapore and Brunei were the pacesetters of zero tariff policy since the past one or two decade/s. 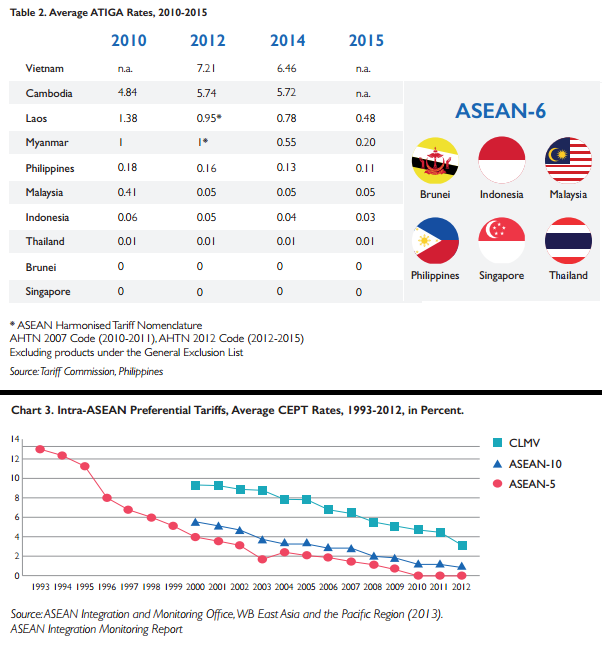 The intra-ASEAN rates of almost zero tariff are shown in the chart below. The most common non-tariff barriers (NTBs) to trade are technical regulations on quality standards and non-automatic licensing of exports/imports permit. But there is one NTB that is lesser discussed -- the various trade and business bureaucracies. 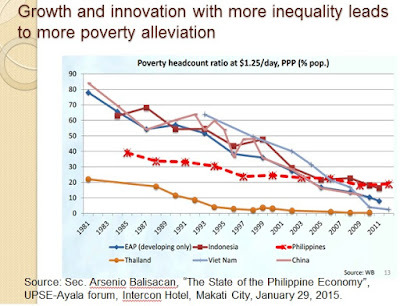 The Philippines was 5th in the ASEAN in this aspect. Another annual report on economic freedom worldwide is the Economic Freedom of the World (EFW) report by Fraser Institute in Canada. Here is the result for the ASEAN in area or section 4 of the report. See the 20-pages paper why unilateral trade liberalization is feasible for the ASEAN member-countries. 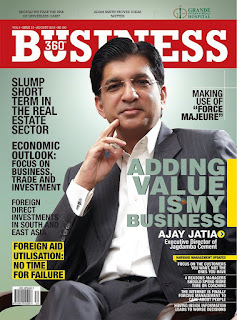 * This is my article in Business 360 magazine in Kathmandu, Nepal, August 2015. Foreign investments are among the key ingredients for developing countries to hasten their growth and development. Two prominent proof of this are small territories, small population, but big economies Hong Kong and Singapore. They started as very poor economies in the 1950s and 60s respectively and their openness to global trade and investments very early have allowed them to maximize the financial, technological and managerial resources that foreign businessmen and professionals could share. There are two main avenues for foreign capital to enter an economy. Via foreign direct investments (FDIs) and via portfolio investments like the stock market. Here we will discuss only FDIs and leave the latter to future topics in this column. The UN Conference on Trade and Development (UNCTAD) has released the World Investment Report (WIR) 2015 in late June 2015. In the report are a number of very interesting data, some of which will be discussed here. Cumulative values of FDI inward stock, net of capital outflows, is an important indicator of foreign investments in an economy. Here are the numbers. South Asian economies overall were not able to maximize the potentials of FDIs all these years. India has the biggest FDI inward stock in the region, but comparing what it got with small population, small territories Hong Kong and Singapore, the investments it has attracted looked modest. Nepal in particular needs to be more open to foreign investments considering the small amount it has attracted with just half-billion dollars as of 2014. Socialist economies China and Vietnam that allowed certain degrees of economic freedom and the market system were able to maximize the potentials and benefits of FDIs. Vietnam’s FDI stock has expanded 23x in just two decades while China’s has expanded by 15x. 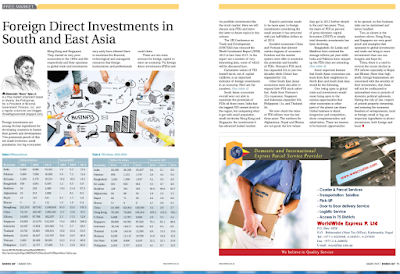 Other South East Asian economies were also able to expand their FDI stock rather fast. Aside from Vietnam’s 23x expansion, Singapore and Indonesia expanded 16x, Philippines 11x, and Thailand 9x. We now check the value of FDI inflows over the last three years. The numbers for Afghanistan, Nepal and Bhutan are not good, the low values they got in 2012 further shrank in the next two years. Thus, the share of FDI as percent of gross domestic capital formation (GDCF) or simply total domestic investments, has been declining. 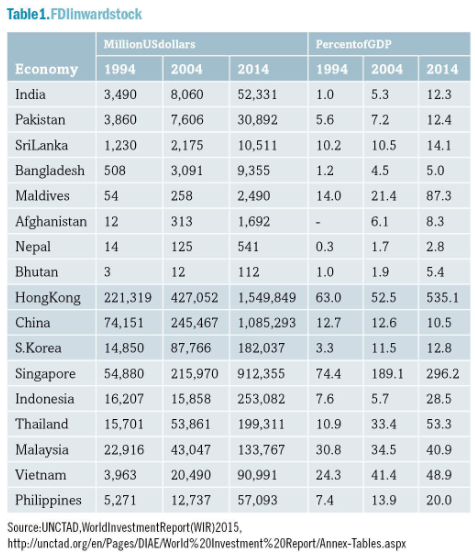 Bangladesh, Sri Lanka and Maldives have retained the average inflows per year while India and Pakistan have ramped up the FDIs they are attracting. Some important lessons that South Asian economies can learn from their neighbors in North East and South East Asia would be the following. One, being open to global trade and investments would mean being open to the various opportunities that other economies in other parts of the planet can share. Global business is about integration and competition, about complementation and substitution. There are lessons to be learned, opportunities to be opened, so that business risks can be minimized and better handled. 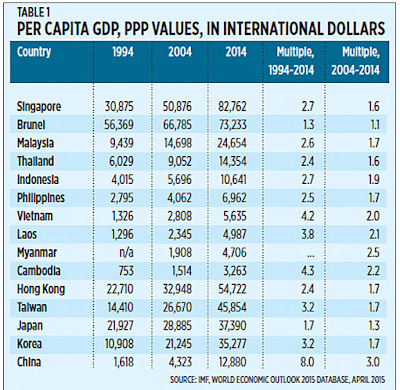 Two, as shown in the numbers above, Hong Kong and Singapore are very good proof and examples that openness to global investments and trade can bring in more investments than one can imagine and hope for. 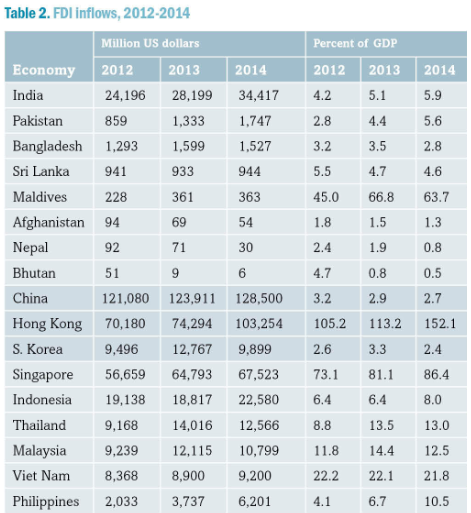 Three, there is a need to reverse the recent decline in FDI inflows especially in Nepal and Bhutan. More than high profit, foreign businessmen are concerned with the security of their investments, that these will not be confiscated or nationalized even in periods of domestic political upheavals. Having the rule of law, respect of private property ownership, and ensuring the economic freedom of entrepreneurs, local or foreign, small or big, are important ingredients to attract investments, both foreign and local. 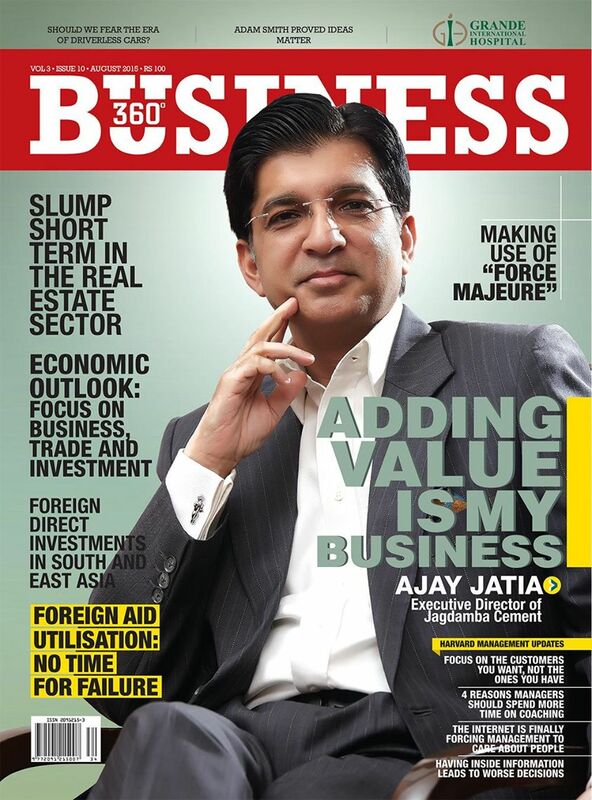 * This is my article yesterday in BusinessWorld Weekender. Many people have mixed feelings and attitude towards economic freedom and inequality. 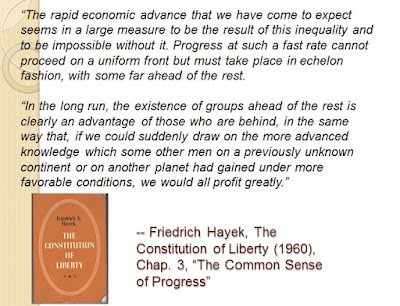 They want to be freed from too many regulations, prohibitions and taxes that tend to stifle individual creativity and entrepreneurship, yet they also want more regulations to control inequality that result from more individual freedom. 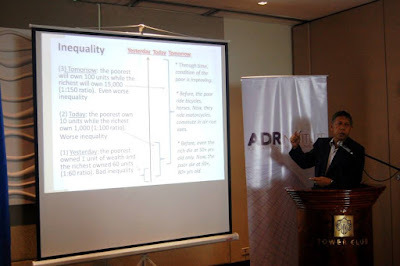 A forum on “Poverty, Inequality and Inclusive Growth” was held last August 12, 2015 by the Albert Del Rosario (ADR) Institute at the Tower Club in Makati. 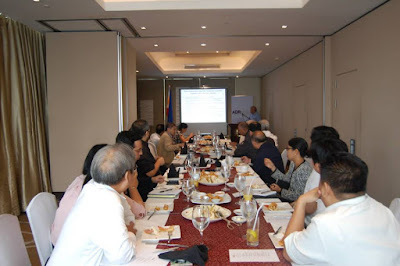 It was convened by Dr. Epictetus Patalinghug, a Professor at the UP College of Business Administration. He also gave a lecture and discussed five topics, (1) macroeconomic policy and poverty alleviation, (2) poverty-growth linkage, (3) inequality in the past and present, (4) employment impact of growth, and (5) how growth can be more inclusive. 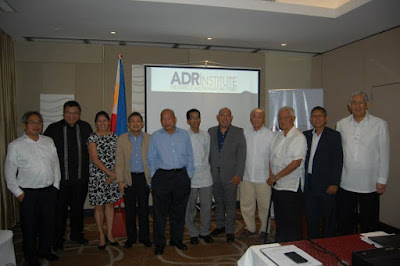 The three reactors were Dr. Vic Paqueo of the Philippine Institute for Development Studies (PIDS), Mr. Ferdie Diaz of the Employers Confederation of the Philippines (ECOP) Co-Chair on TWG on Labor and Social Policy Issues, and yours truly as head of Minimal Government Thinkers. 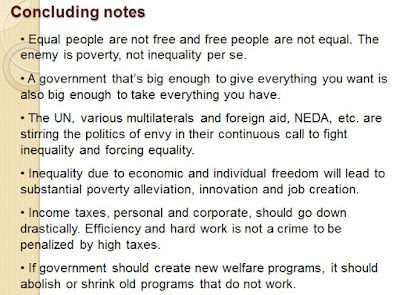 I argued the “politically incorrect” position that inequality is necessary and overall, is good for human progress. Consider for instance how previously heavily-repressed people in the ASEAN – Cambodia, Laos, Myanmar, Vietnam (CLMVV) – have managed to improve their average per capita income over the past two decades. They experienced a doubling (2x) of per capita GDP in just one decade, from 2004-2014. As other people’s income expand very fast, their income gap with their poorer countrymen also expands. 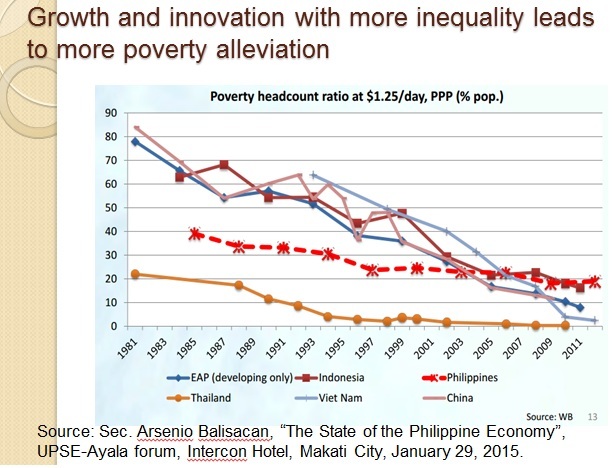 Is rising inequality a bigger problem than rising income for people in Asia? From a global survey conducted by PEW Research Center in the US in April to May 2014, the answer is No. The PEW survey was based on telephone and face-to-face interviews conducted under the direction of Princeton Survey Research Associates International. The average sample size per country was 1,000 adults, 18 years old and above. One question was, "Are people better off in a free-market economy given the wide disparities in wealth that might result?" Agree or Disagree (See Table 2). Respondents in socialist Vietnam and China have high support for free market capitalism despite the rise in inequality, than people who are against it. High support also of people in Malaysia and the Philippines. 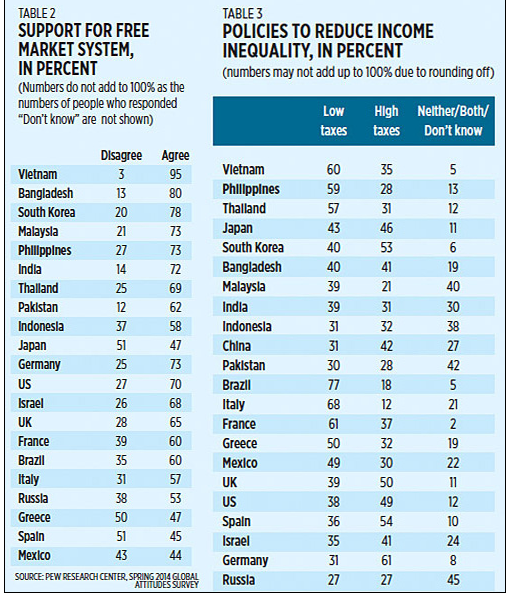 Overall result covering 44 countries, majority of the people around the world were willing to accept inequality to have a free market system. About two-third (2/3) of the survey respondents said they are better off under capitalism despite the inequality. Majority of respondents in Asia, especially in Vietnam, Philippines and Thailand, favored low taxes, not high taxes, to reduce inequality. 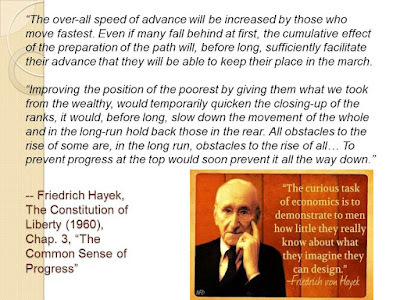 Meaning they are driven less by envy (“tax the rich more”) but by a desire to become rich and middle class themselves, and they do not want high taxes to negate whatever expansion in income that they will attain in the future. Low taxes on corporations also encourage more investments, more jobs for the poor, and economic growth. 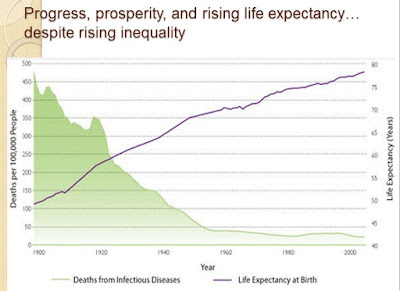 Perhaps the best indicator that the world, the people in the planet today are better off compared to their ancestors despite rising wealth inequality, is the rising life expectancy. Even the super-rich more than a century would be lucky if they live up to 60 years old as average life expectancy in the world at the start of the 19th century was only 48 years old. Now, even the poor can expect to live up to 80+, 90+ years. In the Philippines, the average life expectancy in 2010 was 69 years (67 for males, 71 for females). By now, it should be almost 70 years. Infant mortality is declining too, even children from poor families are dying less than before. 1. 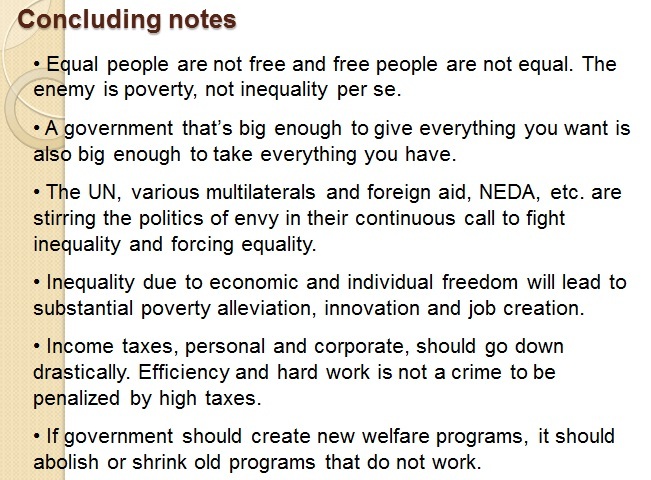 Equal people are not free and free people are not equal. 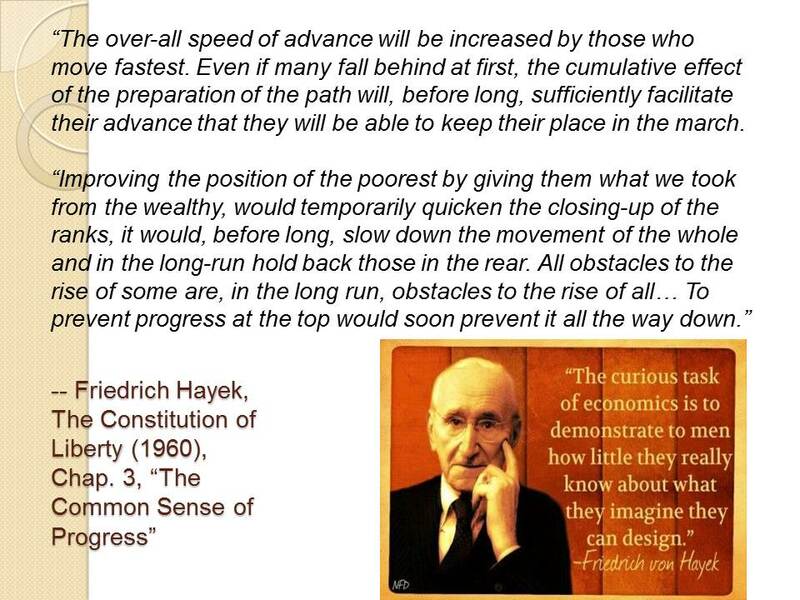 Income and wealth inequality per se is not the problem, high poverty is. To force equality among the people, massive political repression will happen. 2. The United Nations, the various multilaterals and foreign aid, various national governments are stirring the politics of envy in their continuous call to fight inequality and forcing equality. A government that’s big enough to give everything you want is also big enough to take everything you have. 4. Income taxes, personal and corporate, should go down drastically. Efficiency and hard work is not a crime to be penalized by high taxes. And if government should create new welfare programs, it should abolish or shrink old programs that do not work. 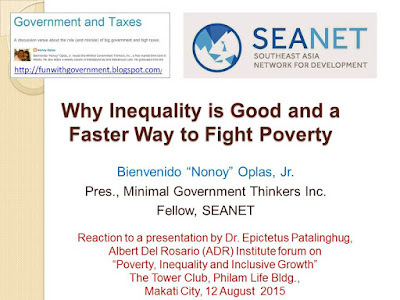 Bienvenido S. Oplas, Jr. heads a free-market think tank, Minimal Government Thinkers, Inc., and is a fellow of the South East Asia Network for Development (SEANET). Here is another instance that while there are hawkish calls for military and political confrontation between the US and China in the future, another side of reality is that there are many instances of cooperation and dialogue between the two biggest economies in the planet. Being a non-believer and non-advocate of BIG government, I side with the non-militarist view, of more trade and investments relations between and among countries as the key to a more peaceful, more prosperous world. There is an existing US-China Intellectual Property (IP) Cooperation Dialogue. The first report was released last year and the new, second report was released by the joint US-China working group only last August 10. 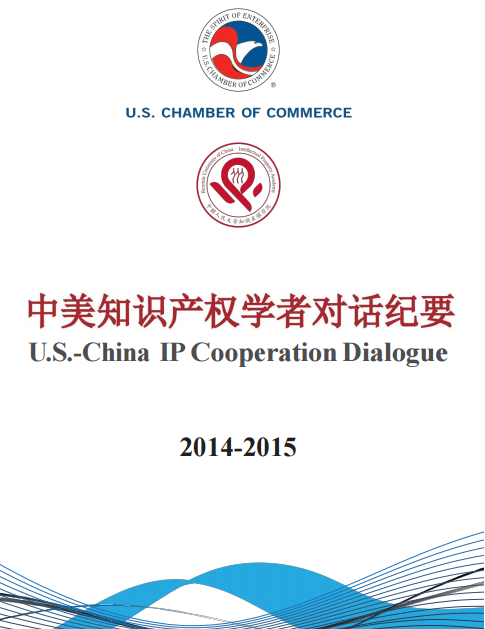 This initiative is a collaboration between the U.S. Chamber of Commerce and Renmin University’s China Intellectual Property Academy. Meaning this is a non-government, civil society initiative, and it brings together 10 thought leaders annually, five each from the US and China. It is a good initiative, to strengthen IP rights in China. Being politically socialist, the possibility of the China government socializing and nationalizing certain private properties, physical or non-physical/intellectual, will always be there, no matter how small that possibility is. Thus, involving the academe and other civil society actors to help strengthen the rule of law, encourage people, public and private leaders, to respect and protect private property is a great initiative. I saw the report. It examines five key areas: (1) IP and innovation in the technical sector, (2) IP and innovation in the pharmaceutical sector, (3) judicial protection of IP, (4) trade secrets protection, and (5) copyright enforcement. • Use quality instead of quantity as the measure of innovation. • Explore the possibility that a judicial interpretation be issued to ensure no injunctive threat is available until utility model patents have been substantively examined for validity. • Adopt a more balanced and market-driven approach to promote innovation by entrepreneurs, inventors and universities. • Improve the patent linkage system, and provide effective protection for clinical data of new chemical entities by using the ongoing effort to amend the Patent Law and the Drug Administration Law as an opportunity for change. • Initiate a special study on establishing a single IP appellate court to unify China's judicial adjudication of IP. • Improve the guiding case system with respect to procedures for reviewing, selecting and releasing cases and support better adoption of case law information. • Recommend research on the possibility to have a stand-alone and uniform trade secret law, in order to effectively maintain a fair market competition environment. • Address new problems created by changing technology and business models; develop a good ecosystem for innovation by the interaction of law and the marketplace; and provide more market opportunities for copyright holders while dealing with piracy. Cool. The report also examines why China’s talent pool and investments did not result in new drug discoveries and calls for transparency and stability of the Chinese legal process, including establishing one single IP appellate court, a searchable case database and an amicus system. As I argued in my previous papers here, not all ideas are the same. Many are too common or wild or plain lousy and idiotic and hence, they do not need protection. Their supply is very high and non-scarce. Bright ideas are scarce, they need protection. An effective IP system that leads to a lot of innovation should be supported by the rule of law and implemented in a competitive environment. Continued innovation, improvement of old and existing technologies and processes, is our assurance for a more prosperous, wealthier and healthier life in the planet. I hope that this non-government, civil society initiative will be heard and studied especially by the China government. Being a member of the civilized international community of nations and governments, respect of private property even by socialist leadership is a responsibility of member-governments. 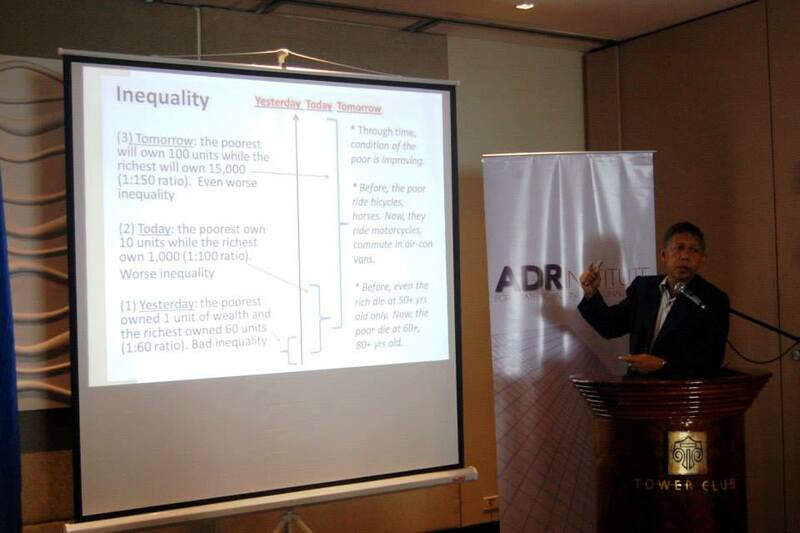 Last Wednesday, July 12, the Albert Del Rosario (ADR) Institute held a forum on "Poverty, inequality and inclusive growth" in Makati. I was one of three reactors to the discussion and presentation by Dr. Epictetus "Lingling" Patalinghug of the UP College of Law. The other two were Dr. Vic Paqueo of PIDS and Mr. Ferdie Diaz of ECOP. 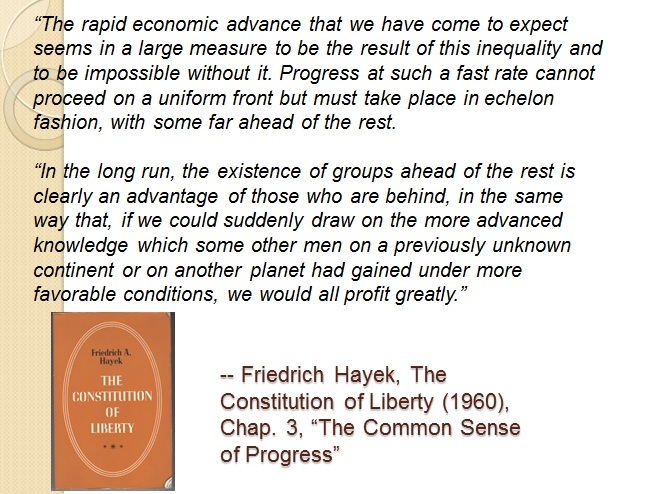 F.Hayek, among other thinkers who have written about the subject, provided the philosophical basis about the necessity of inequality and why things can be done more efficiently if there is diversity and spontaneity, not forced equality, among people. A well-attended event despite the heavy rains and flooding, and traffic, in the morning. I borrowed this chart from Dr. Balisacan of NEDA, also my former teacher at UPSE. An illustration that it's not inequality per se, but the degree of poverty in society, that is the more important problem that people and governments should address. Perhaps the best proof that people today are a lot better off compared to our forefathers, 2 or more decades ago, is this chart -- death from infectious diseases has significantly declined, while morbidity and death from non-infectious, non-communicable diseases, has declined. Among the participants that day. (L-R): HOR CPBD Director Manuel Aquino; ADB Senior Health Specialist Dr. Eduardo Banzon; PIDS Senior Research Fellow Dr. Celia M. Reyes; Former NEDA Director General Romy Neri; PIDS and FEF Fellow Dr. Vic Paqueo; ADRi Trustee and UP Diliman Cesar E.A. Virata School of Business Prof. Emeritus Dr. Lingling Patalinghug; ADRi President Prof. Dindo Manhit; First Director General of NEDA Dr. Gerardo Sicat; RCBC Board Director Mr. Cesar Virata; me, and ECOP Co-Chair Ferdie Diaz. Thanks again to Prof. Dindo Manhit for the invite to that nice forum. Thanks also to Mikee Maralit of the Institute for the photos. My 13-slides presentation is posted here. 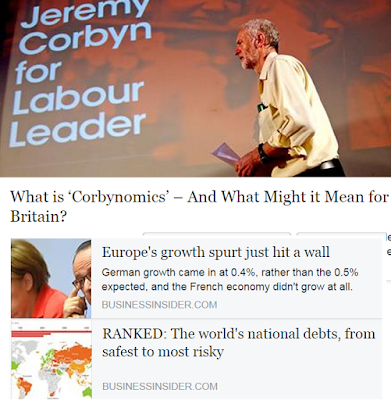 Can UK hug socialism again? One thing I appreciate about many European socialists is that they are more honest. Like Jeremy Corbyn, he's not hiding his socialism philosophy just to be popular. Not that I'm a fan of socialism. I'm for capitalism. creating a National Investment Bank, with the power to issue bonds that would then be acquired by the Bank of England..."
This confirms what I argued during the Ateneo Eagle Watch forum -- Europe's growth is towards flat, even contraction. 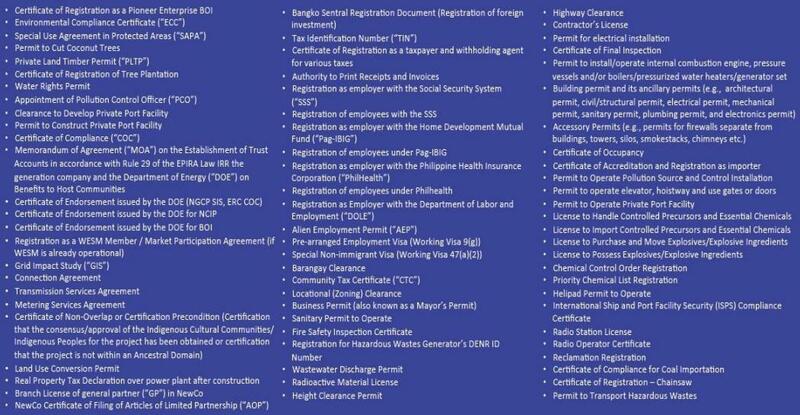 Too many regulations and taxes, too many permits and government signatures, too many welfarists and eco-socialists. Europe grew and industrialized fast on a laissez faire, free market economic system. Let the most efficient, most hard-working people do their thing so long as they do not steal, kill, abduct, defraud people. Minimum regulations and prohibitions. And the two most risky debt addict governments in the planet are ruled by socialist leadership, Venezuela and Greece. Meanwhile, I have met Jeremy's brother, Piers Corbyn, a solar physicist, in a conference in NYC in 2009. While Jeremy is a climate alarmist, Piers is a climate realist and skeptic of "man-made" warming/CC. While Jeremy argues that CO2 is the main driver of the planet's climate, Piers argues that the Sun, and GCRs (galactic cosmic rays) are the main drivers of our planet's climate (warming-cooling cycle). Piers looks like Einstein, long and ugly hair, nerd-looking, has lots of Greek equations in his presentations. ENERGY is development, and that includes electricity. It is not possible for an economy to grow fast and have sustainable development if its power supply and distribution are unstable and costly. Thus, having sufficient, stable, and affordable electricity is a necessary though not sufficient condition for economic development. The Philippines remains to have among the most expensive electricity prices in Asia. Here are data with some breakdown also shown, including the cost of power generation, cost of grid/transmission, and value added tax (VAT) or gross sales tax (GST). 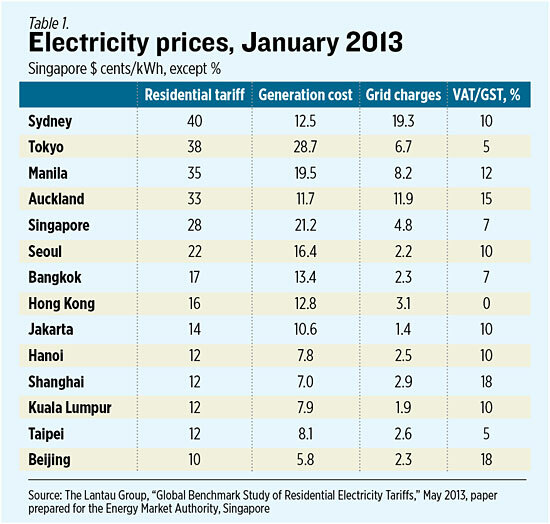 Of the 14 major cities in North and Southeast Asia plus Australia and New Zealand listed below, Manila has the 3rd most expensive electricity prices -- 3rd in overall residential tariff, 3rd in generation cost, 3rd in grid charges, and 3rd in tax rates. One, their government subsidizes electricity while the Philippine government imposes multiple taxes, royalties, and fees on power. The VAT rates are shown above, and royalties alone for Malampaya natural gas are as high as P1.45/kWh, and this is ultimately passed on to the consumers. Two, Philippines power generation capacity is low, with total primary energy supply (TPES) in 2012 for instance only 0.44 tons of oil equivalent (toe) per person per year. Indonesia has twice, Thailand has four times, Malaysia has six times, and Singapore has 11 times that amount. So with these two factors -- high electricity prices and low power gen. -- average electricity consumption is also low, only 668 kWh per person per year in 2012. 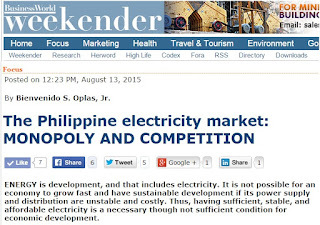 The Philippine power and electricity sector is characterized by a mixture of competition and monopolies. Power generation is generally competitive with many generation companies (gencos) slugging at each other. Power transmission is a national monopoly via the National Gird Corporation of the Philippines (NGCP). And electricity distribution is reserved to geographical monopolies, mainly the 120 electric cooperatives (ECs) nationwide, the biggest of which, Manila Electric Company (Meralco), accounts for about 75 percent of total electricity sales in Luzon and about 55 percent nationwide. The issue of high electricity prices in the country has resurfaced once again but in a different angle. In current practices, the various ECs and distribution utilities (DUs) have bilateral contracts with different gencos, and such bilateral arrangement is sometimes suspected of being “sweetheart deals,” wherein both the gencos and DUs benefit to the disadvantage of the consumers. To address this concern, the Department of Energy (DoE), on the watch of then secretary Carlos Jericho L. Petilla, issued Circular No. DC2015-06-0008, “Mandating All Distribution Utilities to Undergo Competitive Selection Process (CSP) in Securing Power Supply Agreements (PSA).” The order was dated June 11, 2015, or about two weeks before Mr. Petilla’s resignation. The general principles behind this circular are to (a) increase transparency in the procurement process, (b) promote and instill competition in the procurement and supply of electric power to end-users, (c) ascertain least-cost outcomes, and (d) protect public interest. Entities that will be covered are ECs, private investment-owned distribution utilities (PIOUs), multipurpose cooperatives, entities within economic zones, and other authorized entities engaged in the distribution of electricity. Aside from suspicions of “sweetheart deals,” some DUs and ECs have their own gencos. Cross-ownership of DUs and gencos is allowed in the Electric Power Industry Reform Act (EPIRA) of 2001. Two examples here. One is Meralco, whose wholly owned subsidiary, Meralco PowerGen Corp. (MGen), is targeting a portfolio of 3,000 MW by 2020. MGen is planning or constructing two other big power plants, the 1,200-MW Atimonan, Quezon, coal plant, and the 500-MW San Buenaventura, Quezon, coal plant, both slated for 2018. Another consortium, the Redondo Peninsula Energy, Inc., is slated to open its $1.2-billion, 600-MW coal power plant in Subic in 2018. Two are the three DUs of Aboitiz Power -- Visayan Electric Co., Subic Enerzone Lima Enerzone, and Davao Light. By forcing the ECs and DUs to undergo competitive bidding for their power supply contracts, the DOE hopes to break or minimize the practice, or at least minimize suspicions, of price-rigging. This is definitely a welcome move for independent power producers (IPPs) which have little or no cross-ownership and control with ECs and DUs. They will have a fairer and level playing field in getting supply contracts. But while the goal is laudable, the circular will be unable to address other problems and contributors to expensive electricity in the country. Among these are the following. 1. High and multiple taxes, royalties, and fees imposed on natural gas and other energy sources and on electricity generation/transmission/distribution businesses. 2. Expensive electricity is also being imposed recently by RA 9513 or the Renewable Energy (RE) Act of 2008, wherein wind, solar and biomass are given guaranteed prices via feed in tariff (FIT) for 20 years. 3. Monopoly characteristic of ECs and DUs because electricity distribution is considered a “public utility” and, hence, protected by the Constitution and franchise laws. Abuse of power is a possibility that is always second nature to any monopolist. This will require amending the Constitution. A compromise will have to be made, like having a transition period to allow the maturity of existing power supply contracts. The long-term measures to address structural problems that lead to expensive electricity is to limit government intervention, to step back. Like amending the tax code to reduce or abolish certain taxes on energy, amending the RE law to abolish the FIT provision, and amending the Constitution to remove economic protectionism. Election PH 15, Who's the least welfarist?